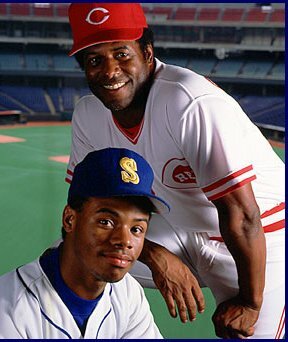 In 1989, Ken Griffey Jr. and Sr. became the first father and son to play in the majors at the same time. After bursting on the scene as “the Kid” and establishing himself as the darling of baseball, Ken Griffey Jr. slowly descended into a curious level of anonymity for a player of his historic ability. Therefore, it was somewhat appropriate that Griffey’s retirement (announced exactly 23 years to the date he was drafted by the Mariners) was almost completely overshadowed by the events surrounding Jim Joyce’s missed call in Armando Galarraga’s near perfect game. The son of an accomplished major leaguer in his own right, Ken Griffey Jr. was destined to be a great baseball player. And, from the time he first picked up a bat for Moeller High School in suburban Cincinnati, everyone around the game knew it. So, when the Seattle Mariners made Griffey the first selection in the 1987 amateur draft, it was just a matter of time before the Kid made it to the show. Griffey got his candy bar a lot sooner than Reggie. Before he even made it to the majors, it was apparent that Junior was going to be a much better player than his father. After all, he even had his own candy bar before the end of his rookie season. Not bad, especially when you consider Reggie had hit three homeruns in one World Series game before getting his. It really wasn’t all fun and games for Junior, however. Shortly after being drafted, the pressure brought about by his fame culminated in a suicide attempt that landed Griffey in the hospital after he swallowed over 200 aspirin. Still, Griffey persevered through those trying times, breezing through the minor leagues as an 18 year old and winning the Mariners’ starting CF job with a tremendous spring training in 1989 (.397 with 19 RBIs). After starting his rookie season in a 1-18 slump, Griffey took off from there and never looked back. He followed up a solid, albeit injury plagued rookie campaign with immediate Hall of Fame-like seasons, quickly establishing himself as one of the game’s best all around players as well as its unofficial poster boy. Heading into the 1990s, Junior was the new face of baseball. 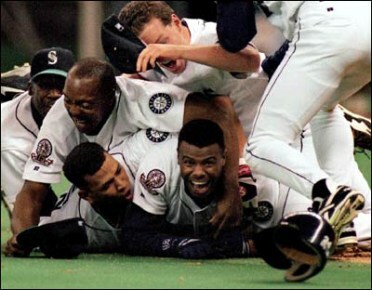 A jubilant Ken Griffey smiles from underneath the pile after scoring the winning run in the 1995 ALDS. Before Ken Griffey Jr. joined the team, the Mariners were a moribund franchise. In 12 prior seasons, the team never won more than 78 games and ranked at or near the bottom of the league in attendance. With the addition of Junior, things began to change. By 1991, the Mariners had their first winning season and more than doubled attendance from the season before Griffey joined the team. Then, in 1995, the Mariners made their first post season, which included a dramatic comeback from being down 0-2 to the Yankees in the ALDS. In that series, Griffey hit .391 with 5 HRs and 7 RBIs, but his slide into home with the series winning run in game five stands out. To this date, that moment ranks as the greatest moment in Mariners history and is often credited with saving baseball in Seattle. It’s debatable whether Griffey was the player of the 1990s. Mark McGwire had more HRs, Albert Belle had more RBIs and Barry Bonds had more runs scored. Still, Junior ranked in the top three in all categories and also had 10 straight gold gloves in centerfield to boot. What’s more, he was also the people’s choice, having been elected to start the All Star Game in eight seasons during the decade. He was also the only outfielder of his generation to be voted onto the All Century Team. Although his greatness was undisputed, it is also true that by the end of the decade Griffey’s star was on the descendent. In fact, he was probably no longer the best hitter (Edgar Martinez was) or all around player (that distinction now belonged to Arod) on his team. Perhaps that realization played into Griffey’s desire to move on from Seattle? In particular, there were often rumbles from the Seattle clubhouse about a rift between Arod and Griffey, the latter ironically resenting the praise being heaped on the Mariners’ new young star. Some of that perceived pettiness, along with comments about being underappreciated in Seattle as well as his initial decision to skip the 1998 home run hitting contest (for which he was called “Ken Greedy, Jr.”), also started to tarnish what before had been a unblemished image. So, with his play in a slow decline and his image a bit muddied, it probably made all the sense in the world for Griffey to seek greener pastures after the 1999 season. That he found those pastures in his adopted hometown of Cincinnati was even better. Before landing with the Reds, however, Griffey did have a chance to bring his star to New York, but instead vetoed a proposed trade to the New York Mets. Who knows how well Griffey would have done in New York (or how healthy he would have been), but one thing that is certain is the second half of Junior’s career wouldn’t have played out in the relative anonymity of Cincinnati. After having a Griffey-like season for the Reds in 2000, a series of injuries and declining ability conspired to lower his profile in the game. The tidal wave that had first started to overtake him when Sammy Sosa and Mark McGwire staged their epic homerun chase in 1998 had broken completely with the eye popping numbers being posted by Barry Bonds. Once considered equals, Griffey was simply no longer able to compare to the unparalleled Bonds, not to mention the many other young stars coming up in the game. The pink elephant in the discussion, of course, is performance enhancing drugs. Many of Griffey’s contemporaries, who passed him by in the later stages of his career, have been stained by the stigma of PEDs. Griffey’s name, however, has managed to remain clean. For some, that recognition may wind up tilting the scales back in Griffey’s favor. Whether or not he ranks as the best player of his generation, Griffey will go down as one of the most dynamic and talented players in the history of the game. For that reason, it’s a shame his career had to end on such a low note (his OPS+ of 27 is by far the worst final season for a future Hall of Famer with at least 75 PAs), especially considering the embarrassing sleep-gate incident. A career of Griffey’s magnitude merited a celebration, but instead it seems as if it has ended without much notice. Then again, considering Griffey’s often expressed feelings of being underappreciated, as well as his long maintained desire to remain private, maybe it was a fitting ending after all?